Your Hole in One Program just got even better! American Hole 'n One is proud of our 25 year partnership with General Motors and their brands. This year, we are excited to offer you even more value and more ways to drive test drives to your dealership. 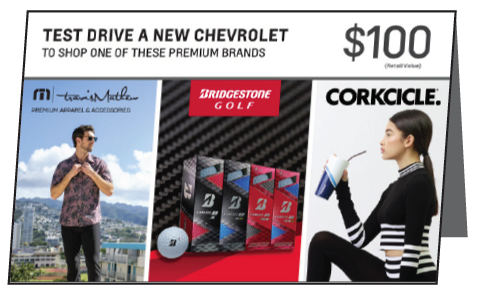 With your exclusive Chevrolet Hole in One Package, you'll get the most high value bonus prizes in the industry, premium custom on-course signage, A+ rated coverage and much more. Read on for your program details. 100% Funded By Chevrolet, this program provides personalized gift cards with your dealership's name and the invitation to come and take a test drive in order to activate a $100 gift card to one of these three great brands. More test drives mean more cars sold. After 250,000+ test drives, 10,000 vehicles sold and 78% dealer participation- we know what works for you. For more information on your exclusive Chevrolet Hole in One Insurance program, download your full program details here. Have more questions, you can contact us at 800-822-1781 or fill out the form below and we will get back with you by the next business day.